Do you know why I love blogging and don’t want to give it up, even when time grows scarce and I can’t get into this space as often as I’d like? It’s because blogging gives me a little bit of room to express myself. My interest in and passion for books and all things bookish, particularly children’s books, predates my foray into motherhood. It predates my short career as a public elementary school librarian. It predates the two delightful years I spent in library school earning my master’s degree in school media. It predates my short public school teaching career. It even predates the five years I spent as a library aide in a public library. I’m pretty sure my interest and passion were ignited on my mother’s lap, though I don’t have strong memories of spending lots of time being read to. My love of story is something that has been with me for as a long as I can remember, and publishing here at Hope Is the Word reminds me to stop and savor that. Here’s a list of links to all the original posts (which each contains a list of the eligible titles for that decade/month) and the link up posts. The link up posts are where to go if you want to see what I and others read. Picking favorites is very hard, for there isn’t a book on the list that I didn’t enjoy. The one that stands out the most to me is Invincible Louisa by Cornelia Meigs, probably because of my nearly lifelong love of Little Women and my fascination with the Alcott family. I still think about this book and the Alcotts some eight months later. It spurred me on to read another work of children’s fiction about the Alcotts, and it has inspired me to move Alcott’s other works higher up on my mental TBR list. I have to include Carry On, Mr. Bowditch by Jean Lee Latham on my top picks list because it is such an interesting and compelling story, and I enjoyed so much sharing it with my girls. Having never read it before, we have been very gratified to find references to Nathanael Bowditch here and there in our studies. (For example, in another Newbery read-aloud, Heart of a Samurai–it was yet another connection we made). Lastly, I have to mention The Mostly True Adventures of Homer P. Figg by Rodman Philbrick. What an over-the-top adventure this one is! I was so entertained by this book. However, despite its entertainment value, this is a story with depth. I handed this one off to Louise and she thoroughly enjoyed it, too. There isn’t a bad one in the bunch, though. I am very glad to have read all of them, and I’m already looking ahead to January when we’ll pick up the challenge again. Who’s with me? I’d love to hear all about what you read and what you liked and/or disliked. Thank you so much for hosting this challenge, Amy! 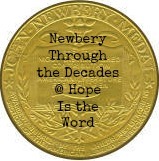 I love your enthusiasm for books in general and your goal to read the Newbery winners. You’ve got an impressive start. I truly enjoyed every book I read too, and I do hope I’ll make time again next year to join you for this challenge. It was enriching and made me see that I need to keep current on the new winners each year. Thank you, Lisa, for your sweet encouragement! 🙂 I’m so glad you enjoyed it, too! Yes, thank you, Amy. I didn’t get to participate as much as I wanted to—too many projects, not enough time. However, next year I want to concentrate on older children’s books, and so I hope to read more Newbery books along with you.